Posted by Steve on December 8, 2016 . Leave a comment. I’m told people don’t say it often enough, but I have to admit to hearing it on a fairly regular basis. In fact, I heard it again not long ago when one of my clients introduced me to a friend of hers with a couple of horses she was having some hoof difficulties with. And so, as I trimmed my client’s horse, her friend watched while I explained what I was doing and why. This particular horse – a Mustang – has wonderful feet that made an excellent aid as I described how some valuable insight into proper hoof wall trimming can be found through careful observation of changes in hoof tissue as the wall is trimmed, and how that relates to the abrasive forces the feral horse is subjected to by nature. Not surprisingly, this was news to her, although it probably shouldn’t have been since her horses were being trimmed by another “barefoot professional.” But maybe I’m different than most in that I view every trim as not only an opportunity to help the horse, but also the chance to help educate the owner (and any innocent bystanders!) as well. Unfortunately, there’s way too much bad information out there – thanks, in a large part, to the Internet. The Web has made it all too easy for anyone and everyone – educated or not – to share their brand of “expertise” with the world. I’ve discussed some of these problems with the “expert” side of this bad-information-propagation equation before (see The “Expert Syndrome” and The “Expert Syndrome” Revisited). Much of this seems to be a deliberate effort on the part of the propagators to set themselves apart in the world of hoof care by promulgating variations on a (logically-sound hoof care) theme that manifest themselves as what can only be described as patently illogical theories and practices. Fortunately, most of their information won’t stand up to close scrutiny by even a moderately logical thinker. Consider, for example, the popular trimmer who uses the rather cryptic phrase “the heels follow the toe” as explanation for her belief that horses’ heels shouldn’t be trimmed. Seriously? No wonder her “after” photos show more distortion of the hoof capsule than the ones taken before she began “helping” them! Others may sound more reasonable at first blush, like another popular trimmer who claims that if the bars of the hoof “grow back quickly” after being trimmed, they must “want to be there,” as if his mere saying-so offers a reasonable alternative explanation for what is simply normal growth not subjected to the same abrasive forces in the typical domestic equine environment as they are in the feral horse’s. My fingernails grow pretty quickly, too; I guess they must “want to be there,” so I’d better stop trimming them! One of my clients recently told me about a Standardbred in her barn that apparently “paddles” when he walks. His owner carefully explained to my client how these horses are “bred to walk that way so they don’t interfere when they race.” And how her farrier is now attempting to “correct” the gait by deliberately unbalancing the feet. Or perhaps the client’s friend who cannot accept that her horse’s ever-increasing lameness issues could possibly be due to her farrier’s (bad) work, because he’s on the board of directors of a prominent farrier organization. Perhaps the most potentially-serious example of this bad-information problem I’ve personally encountered of late was with my client whose horse’s normally-healthy hooves had begun losing sole concavity, developing white-line separation around the entire hoof wall, and frequently abscessing – all signs of a dietary problem leading to laminitis. His veterinarian and barn manager both dismissed the idea of diet issues, instead blaming the horse’s problems on his hoof care. The vet carefully “explained” to him that the horse’s feet weren’t trimmed to “look like Quarter Horse feet,” and that the abscessing was caused by the forces at breakover traveling up the “long” toes and constantly bruising the tissue at the coronary band. I’m not going to describe the details of her recommended treatment now, because I may want to write a more detailed article about this entire experience in the future, but let’s just say it involved surgery, reshaping the hooves to “look more like a Quarter Horse,” and shoeing! Fortunately, this horse owner isn’t one to merely accept what others say, regardless of their level of education, experience, or presumed expertise. He dismissed the vet’s explanation and advice as illogical, and, after discovering the barn manager had been feeding his horse three pounds of vitamin/mineral supplement a day instead of the recommended amount, he decided to move his horse to another facility. Within a few short weeks, the white-line separation had nearly disappeared, the sole concavity had reappeared, and no further abscessing had occurred – all with only dietary changes and without following any of the veterinarian’s recommendations. My point in bringing up this particular client’s experience is only to hopefully reinforce to you my strongly-held belief that one must always question advice, no matter the source! (For a more in-depth look at bad advice from “experts” that nearly cost one horse his life, check out Toy Story.) Insist any advisor explain his or her recommendations until you feel confident that the logic behind them is sound. Avoid courses of action that strain credibility, or seem unduly complicated and counter-intuitive. The design of the horse’s limbs makes sense; so, therefore, should any advice about caring for them. The graphics I’ve included in this article illustrate a fine example of a very common practice endorsed by many, many veterinarians and farriers that completely falls apart under close scrutiny. 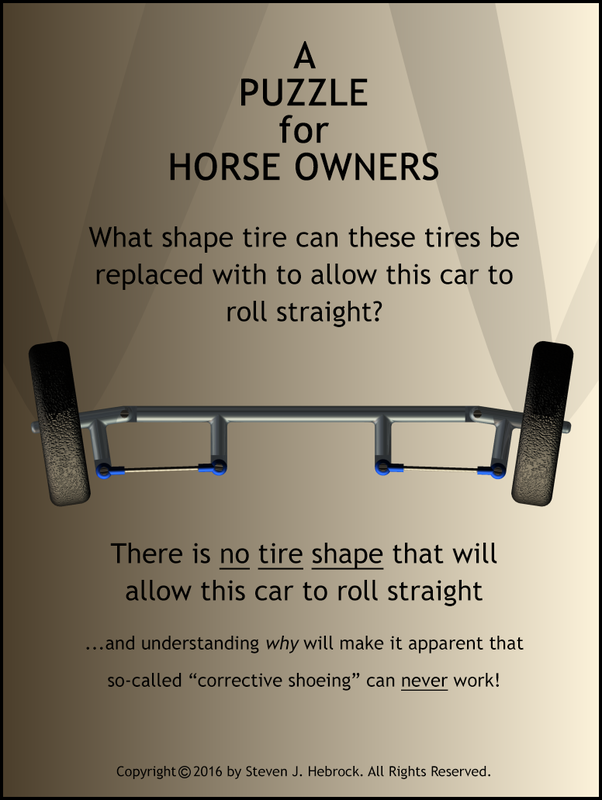 Most people will readily grasp the absurdity of believing tire shape can somehow fix the bend in the axle, yet many will just as quickly accept exactly the same premise when “special” trimming and/or shoeing is touted as a “treatment” for their horse’s splayed or pigeon-toed legs. What, exactly, compels someone to out-and-out reject the former, but never question and, instead, accept the latter? If every horse owner would just take the time to think through every piece of advice, carefully considering not only the source, but also what’s actually being offered, I believe our horses would experience far more freedom of motion and long-term soundness. 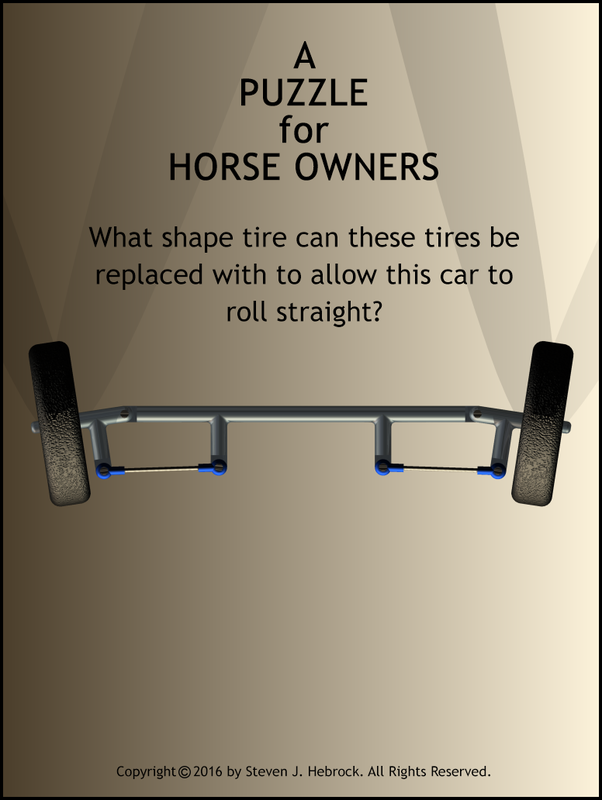 Share the post "“Three Little Words” – A Puzzle for Horse Owners"